Ok, so I was lucky enough to have the opportunity to practice on my new skates the day after they were mounted. This is good, because it gives me a week of adjustment period before I have any more lessons, so I can hopefully get them somewhat stable, if not actually completely correct, in terms of adjustments. Clearly, the boots and wheels have seen some use. My boots are about three and a half, almost four, years old. This is the longest I have used a single boot without it totally breaking down. I did use a Jackson figure boot for about 5 years once, but it was pretty shot after 3. This was when I was sick, so I was having a lot of other issues, and new skates were not a priority at the time. After I was over my illness I moved to the Harlick boots, because I wanted a custom fit since all the illness-related weight issues had been giving me foot pains. I know there are many people with many opinions about the Harlick brand, but personally I love them. My skating has improved so much with these boots and I think they are fabulously comfortable. Sometimes I still get awful foot pain and cramps (I think still related to the former health problems), but my feet feel pain free when in the Harlick boots. At this point, I can’t imagine skating without them. As for the wheels – I have been on the Roll Line Giotto figure wheel for quite some time (somewhere between 8-10 years I think, although these particular wheels are only 2 years old, but probably in need of replacement this year or next), but I only started using the Roll Line Grease dance wheel last year. I really like the Grease for dance. It seems to give added stability to my dance skating, while still having good roll. 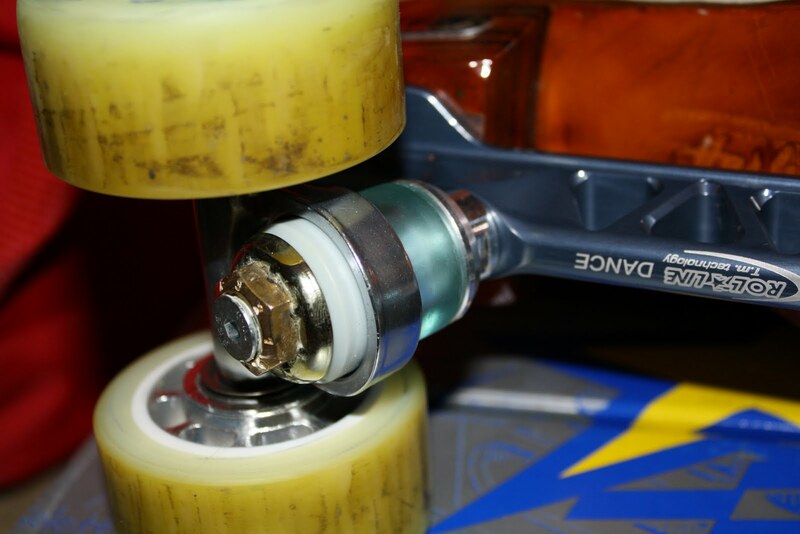 Recently, I added spacers to the inside of the wheel (between the bearings). I had heard that spacers will slow a wheel down, but the spacers in the Roll Lines seemed to speed them up! 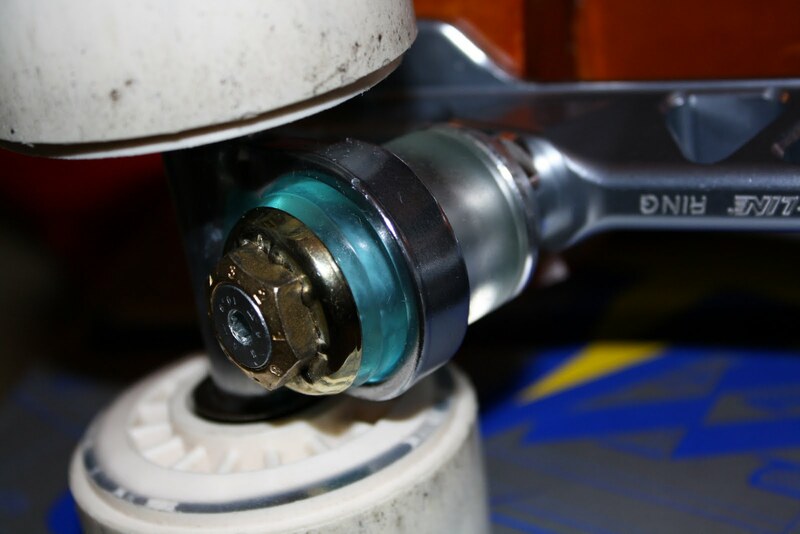 There has been some theorizing that the metal spacer adds stability that the plastic hub is lacking, and helps keep the bearings aligned, leading to better performance. In any case, I liked them before, I love them with the spacers, and now I want to try spacers in the figure wheels to see how that goes. As for the equipment that I am replacing… My previous plates, the Atlas brand, used rubber cushions – medium strength (black color) for dance and hard strength (natural/tan color) for figures. For dance I had a fairly tight action (between 8-10 clicks), and for the figure skates I would adjust to all the way loose for loop skating (the small circles), and about 12 clicks of tightening for the larger circle figures. For figures, you want to be able to create a stable consistent edge and sustain it for a long period of time, so you do not want as much give or motion in the skate. For the loops you need to be able to get a very small, tight curve so you need a much looser action. In any case, that is what I was using before, for comparison sake. I know, I know, that’s all about the old stuff, and my point in writing this is to blather on abou the new stuff. So I shall. As you can see, there are two different types of materials, rubber and urethane, and various hardnesses for each. The urethans are all harder than the softer two rubbers. The grey ones are just about in the middle, so I figured they would give a good indication of how much I would need to go up or down in terms of hardnesses. In any case, after a few minutes on the grey cushions I knew they would be way too soft for figures, and possibly even too soft for loops. So, off to the side and me popping on the clear blue urethane cushions. Or, well, trying. Luckily and awesomely one of the other skaters, who is quite knowledgable about these skates as his family had at one point 11 pairs in use between them, was able to help me remove some of the original parts which felt as though they had been assembled by a gorilla. Once the new ones were on he also helped me crank them all the way tight. He is also going to look at them in a few days/weeks after I figure out the cushion settings I want so he can adjust the pivot pins for me. Sweet. Went out to skate, and the whole skate still felt like it was shimmying around the figure line. Sigh. My turns, however, felt pretty good. Just can’t hold an edge. So back off the floor and switching out to clear uppers (hard urethane) and clear blue lowers (medium urethane). This time the parts all switched around much more easily. I still had to crank them fairly tight, but I was able to skate some ok figures on them. I will say I do very much like how the plate feels. It feels like I am really up over my skate in a way that wasn’t possible on the Atlas (I should know, I skated on them for 13 years). This is good because I don’t have to do nearly as much work to get the skate to do what I want, although things don’t feel precisely right yet. On the other hand, I don’t know how I feel about these cushions. They feel like they are constantly moving, and any miscalculation on my part sends them off on a crazy trajectory. Perhaps I need to adjust to the skates and how they react. Perhaps they need to be adjusted to how I skate. Somehow I don’t think things are quite exactly right for them at the moment, but, I do like the way the plate feels under my foot, so hopefully we are headed in the right direction. The current figure combo: clear/blue urethane. After playing about with the big figures, I did loops for a little while. Loops were… somewhat terrifying but interesting. With the same clear/blue combo, I loosened the plates up by about 12 clicks. This was pretty much a PITA. I will definitely need a different wrench or, more likely, a torque amplifier. In any case, I think this adjustment may not have been enough. In any case, when I did get a good edge it was very nice, but I think that overall I was shifting my weight far too much to get the loops accomplished in any sort of acceptable fashion. Not sure if it was me adjusting to the new position of the plate, me not skating well on account of not trusting the new skates, or if the urethane is just so reactive that it won’t keep the curve as I shift my weight around on the skate. I did often feel like the skate was resisting me a bit on the loops. I think perhaps I will try to loosen them up nearly all the way and see how that goes this weekend. Hopefully I can at least get through another practice and lessons with this, because I don’t want to be trying out new cushions during my lesson. After that… I might start playing around with the rubber cushions. Based on the hardness chart, I wonder if using a yellow hard rubber upper with a blue urethane lower would be a better solution? Or even yellow hard rubbers all over? 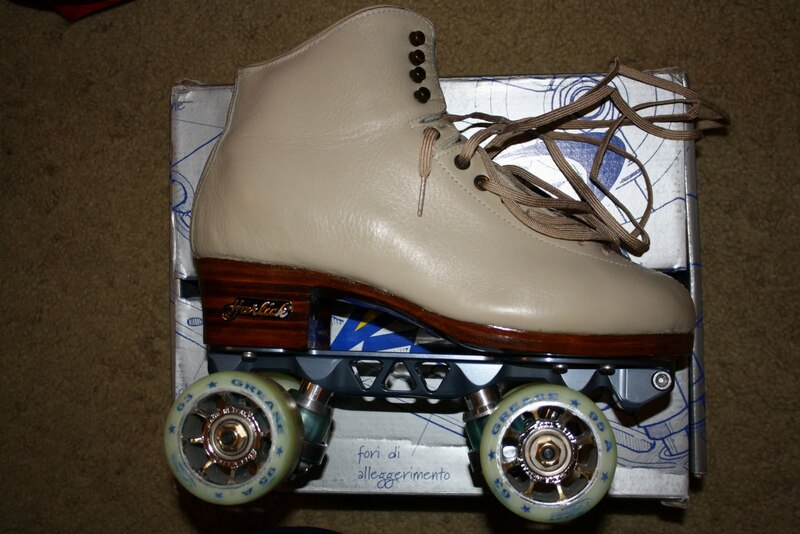 I do know that rubber has a bit more of a “break in” period than the urethane does (it was the same with the Atlas), so I may have to give them a few weeks of try out time, but hopefully if I can keep getting 3 days/week of practice I can have this all figured out by mid-September. In any case, overall the new figure plate gets a tentative thumbs up because I really do like the way the plate feels, but I just don’t know how I want things adjusted yet. As for the dance plate – let me just say it now: MAD CRAZY OBSESSIVE LOOOOOOOOOVE!!!!!! My new dance plates are 5mm longer than my new figure plates. This seems to have been a good suggestion by the sales rep. The figure plates are 1mm shorter than my old ones (in terms of wheel base length), so the new dance ones are 4mm longer than the old ones. Let me just say, wow, what a difference. 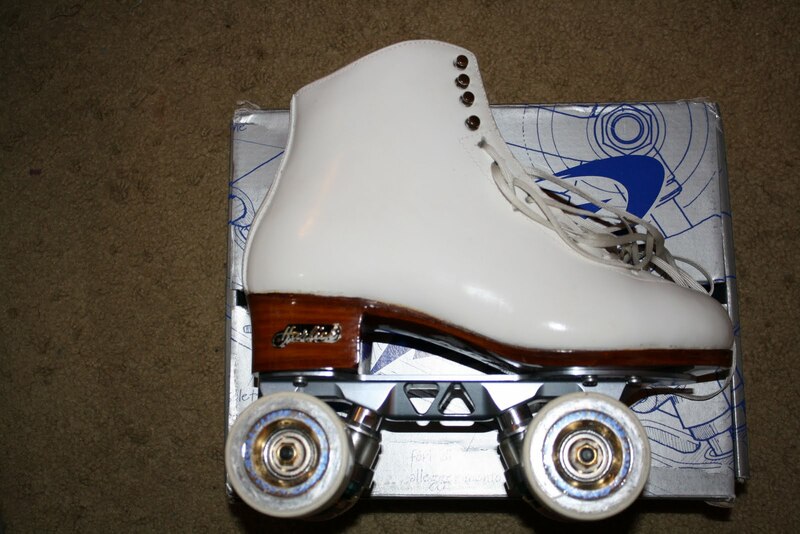 For the figure skating, I want to keep a shorter wheel base to make the quick turn and loops easier, but for the dance skating, having a longer wheel base to push off of really helps in terms of power and stability. As far as I know, the old plates do not come in half sizes like the new ones do. So I really don’t think having these different length would have been possible before. In any case, the dance plate also came with the grey/grey combo, and by the time I had finished messing about with the figures, I didn’t really have time to change anything out there, so I just went out and skated. It felt a bit wobbly, so I cranked the action down pretty tight. They were just shy of being unstable, but they felt amazing. After a mear thirty minutes I had gone from having no idea what to expect to skating some of the hardest American dances much better than I had ever skated before in my life. I think I need to play a bit more on them to get the feel of the turns, but overall even those were feeling good. These things are fabulous. The extra length allows me to push harder, the design of the plate puts my weight exactly where it needs to be over the skate, and they can get a crazy deep curve like nobody’s business. They are super lightweight too, which is good for not getting tired so quickly. I love them. My only issue is that I think the grey/grey combo is just a bit too loose for my weight, since I did have to crank them down so much. After practice I popped in my clear blue urethane uppers, but keeping the grey lowers. Changing things out on these skates was MUCH easier than changing them out on the figure skates for the first time. In any case, I will test this combination out this weekend and see how it goes. I really don’t think I want to test out any of the rubbers for dance – the urethane seems to provide enough stability while still getting very quick response. If I do not like the blue/grey combo on Saturday I will put the grey uppers back in for Sunday, since I already know I like that well enough. My overall assessment of the dance plate: Standing ovation! I love this and even after only thirty minutes I totally think it was well worth the cost of the upgrade. Amazing, and I can’t wait to see how much I can get myself to improve now that a lot of things that I was working so hard on now seem so simple. The next experiment – blue/grey combo for dance. In any case I am very excited for the weekend – can’t wait to test out the new dance combo and play with the figures a bit more. Hopefully I find some sense of stability, but if not then I will be playing with the rubber cushions soon enough. 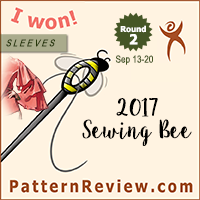 In the meantime, I can keep working on trying to finish up the remainder of my summer sewing projects. It is hard to see because I showed the outside edges of the skates, but if I had shown the inside edges on the boots you can see where the boot bulges out a bit where the ball of my foot is. On the white boots, the plates look really short, but actually the front wheels are just under the ball of my foot (I have really long toes). Since for figures and loops the goal is to minimize your weight shifts and create a pure edge, having the skate right under my foot like that means I have to be *really* precise with my weight placement. 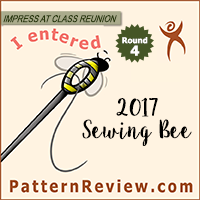 This is good, I think, because when I do turns (threes, counters, rockers, brackets – like in ice) I really have to move very minimally and the turn just happens. For loops, in roller we have to deal with friction a lot more than in ice, so I would assume the feeling of pressure in the skate is different than ice, but body posture is probably similar. Since I don't have to move my weight as far to get to the extreme edges of the skate, I can make the tight curve happen faster (except right now I feel like I don't know what the cushions are doing so I don't trust them, but in theory this should be better). The figure plates are 1mm shorter in the wheel base than my old ones. The right foot feels fantastic like I am right over it, but the left one feels a bit short. On my old ones I always had more problems with my right foot, because I felt like I couldn't get the weight far enough up on the toes. I guess the right foot is shorter than the left? In any case, I think this plate length *looks* short but actually is better for my feet because I have long toes. I do agree, it is just barely long enough, which I think will help me do the difficult skating I am trying, but I don't think I would recommend this short of a setup for someone who is a beginner or an older adult skater (we have people skating through their 80s, so when I say older I mean like a lot older) who wouldn't need to do turn figures or the loops. As for the dance skates – the tan boots – those plates are probably the “correct” length for my boots, since you can see where the toe stop would go if I put it in there (I usually leave them out, because for tight footwork in dance skating it just gets in the way. These came with small dance plug stops but I never use them so I just left them out). For dance skating you need to be stable at higher speeds and be able to push easily, so having the longer wheel base makes sense. These feel incredibly stable (except for the cushions, which I am still toying with), easy to push, and easy to get super deep constant edges. They are great dance plates. These new ones are 4mm longer than my old ones, and I think it really helps. I think going up 4mm in the figure skate would have made loops skating much more difficult, so I decided to go 1mm shorter on those. The less wheel base turning around a loop is less friction, which makes it easier. So that was the logic in getting different length plates for the same sized boots. In any case, yeah, I am still adjusting to the lengths a little bit, but I am pretty sure I am happy with having the half size differences between the two plates because they are now *very* specialized for the different skating styles. For Atlas, they only go by whole sizes (size 14 = 13.7cm, size 16 = 15.8cm), so for those my only option was really the size 15. For the Roll Line, I just barely fit the 145 so I decided to get that since it was closer to the old size. In any case, sorry for the long ramble, but thought this might be helpful in explaining why the plates are different sizes and why they look so short.